It isn't necessary to pretend to be anything you aren't-- not with those who you love and who love you. I often see people feeling emotions (usually sadness) and wonder why I don't feel it too. I've given up on that and just accept who I am. You know those poor little babies that are caged in their cribs in orphanages in foreign countries? Because they aren't given the love, nurturing and interaction that they need and crave, they end up being stunted, literally. Their brains don't fully develop in certain areas and therefore are never "normal". I think there are a lot of people that didn't get enough hugs/kisses, attention, support, etc from their parents and caregivers. And I think that as a result these people grow up unable to have and show their emotions because their brains weren't raised with that and didn't learn it. Maybe your brain didn't learn those things which is why now you are having a hard time with feeling things? I don't know, but I think you have been searching for reasons and I hope you don't blame yourself. You are a beautiful person, inside and out. And I hope that your struggles become small and all the bright and happy things in your life take up that space. I care about you immensely, and I know many people do. Thank you Lisa, mrtl, Jessie and Jessica. I'm doing ok. In fact, learning about my asperger syndrome has been a relief. Suddenly so many things make sense to me, and I'm no longer thinking I have to fit some kind of emotional health standard. Lisa, I guess pretending was a misnomer. But breaking habits is hard to do. In this case, thinking of myself as someone with depression and trust issues has become a habit. Not that I have never been depressed, but I'm not now. Not that I don't have trust issues at times, but those things aren't what make me feel blank. I mimic emotions without even trying. I've truly been doing it since I was very little. It's not something I turned on consciously, so I won't be able to turn it off that way either. I probably can't stop doing it. I'm not sure I want to, because it helps me connect with people. I'm talking about low level cognitive processing, automatic stuff, you know, just above involuntary actions like breathing and swallowing your own saliva so you don't choke. mrtl, yep. We're all pretending when it comes to thinking we have control. Jessie, Thank you for your kind words. 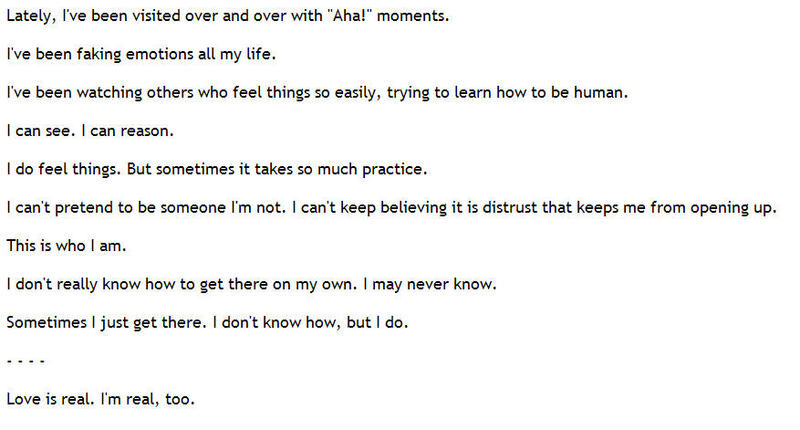 I'm really ok. It says something that this post causes a wide variety of reactions in other people. I wasn't sad when I was writing it. I'm not sure how to describe what I felt, except to say that it felt like I made a step toward true self acceptance as soon as the words were off my fingers. I don't think I was completely ignored as a kid, but I think your comment is hitting on something important here. My mother did not neglect us when we were little, but she was often self absorbed (side affect of many forms of mental illness, I suppose). That may have actually been more comfortable for me than if she were in my face all the time. I mean, I was different as a baby than my sister who was a more emotionally responsive baby. My brother was more like me, except very passive. But he was also very sick as a baby (lung issues, asthma), so it probably wasn't as noticeable that he was passive and somewhat emotionally flatter than normal. Dealing with an emotionally unresponsive or uncommunicative kid must be very challenging. From the time I was a baby,I went limp when anyone picked me up. I didn't hold on, or hug. I often didn't look people in the eyes. I didn't look down, I would just turn away. When I got to be 3, 4 and 5, I wanted to do strange things for fun, like scrub the grout between the bathroom tiles for hours with a toothbrush, or reorganize the drawers in the kitchen. If someone took control of my body without my permission (like at the doctor's office, or on Santa's lap) I would punch or kick them. Before she had her psychotic break, my mom just sort of went with it. We had rules to follow and manners to keep, but she didn't tell tell us we should be different or shame us for being ourselves. Before she got really sick, she cooked 3 homemade meals a day. She sang to us and taught us how to read (my brother and I both read books at 3 years old) and write and play games. I remember her running with us at the park, or running with us hand in hand from a store to the car, being super silly and yelling at the top of her lungs. Thank you again, everyone. Discussing this is helping me and I appreciate you all reaching out to me. Love is as real as it gets. I'm glad you are feeling it, consciously and not just as a learned reaction. Reading your comment was very insightful too. I'm glad you added those good things about your mom to balance some of the bad impressions we often have of her. It makes so much of what you talk about (regarding her) more understandable. Sometimes pretending is the gateway to recognizing what that feeling looks like. And I think that's a good thing. 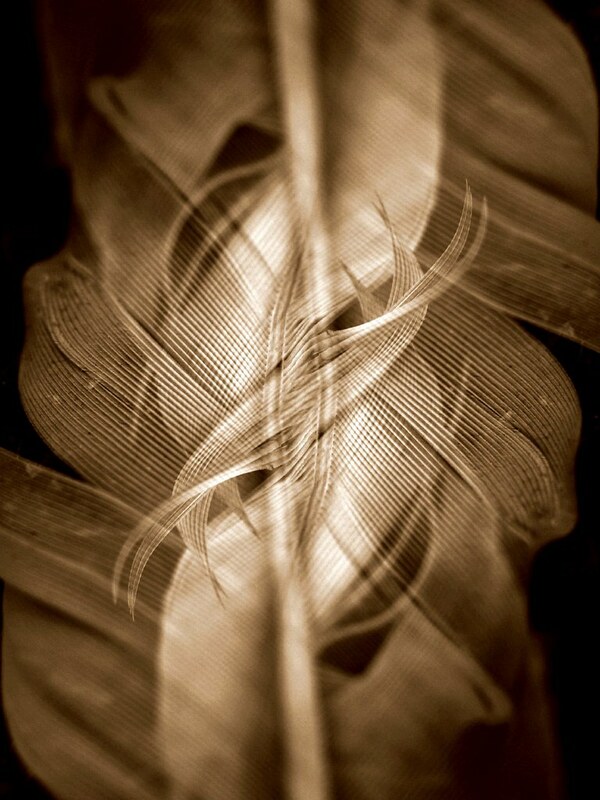 I love the "curly" appearance of the feather fibers in the photo! I think that's sort of the form emotions take in my head, like intertwining fibers of the same core headed different directions together.